When Arizona-based company focusIT needed to redesign their website, they came to Sparkfactor. They also wanted a consistent look across many deliverables, which all hinged on the design of the new website. 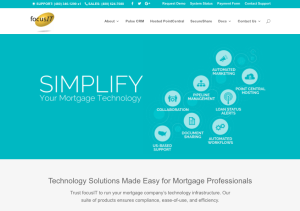 FocusIT specializes in Software as a Solution (SaaS) products for the mortgage and finance industries. They have their own proprietary CRM and document sharing system. When starting on the project, they wanted to consolidate pages on their website for a better user experience and we helped them rewrite the content. 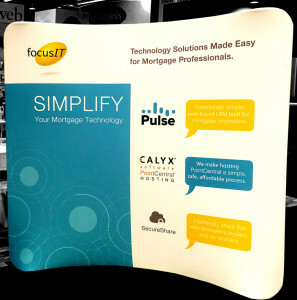 Once that was in place, our developers designed a fun look that easily conveys what focusIT is all about: cloud-based solutions for those in the mortgage and finance industries. The icons on the homepage help illustrate what each solution helps a client accomplish, whether it’s document sharing or automated workflows. Throughout the site, a speech bubble symbol is used to call out important information: sometimes testimonials, other times a product-related message. Once the design was approved, we used WordPress to build out the website, which allows focusIT to easily maintain their own site. After the redesigned site went live, we also created other deliverables to keep branding consistent with the new look. We designed a brochure in InDesign, as well as trade show booth background. The curved backdrop was designed in InDesign and Illustrator and utilizes the speech bubble symbols to clearly and concisely explain focusIT’s three main solutions. As you think about redesigning your website, make sure to think about other materials that might also need a design update. Having a consistent design will help your brand be recognizable across multiple touch points and help potential and current clients feel comfortable when purchasing. Need help with your website and brand redesign? Sparkfactor can help.